Perfect for the traveling photographer or enthusiast to keep expensive gear securely tucked away yet close at hand to capture the shot in a moment. Its unique back-entry compartment provides easy access to camera gear when setting up (keeping the harness off the ground and clean of debris), plus extra security when on the move. 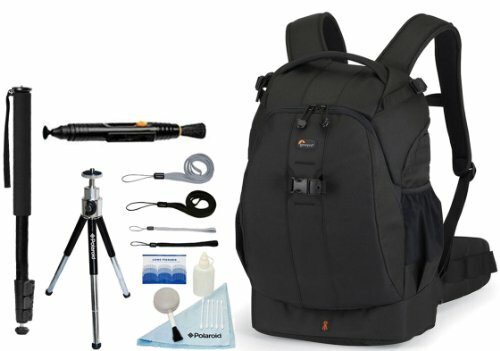 1 pro DSLR with lens attached (300mm f/2.8) plus an additional camera body, 4-6 additional lenses, chargers and cords, filters, flash unit and 3 memory cards. Size (Interior): 10.6W X 5.9D X 16.7H in. 27 X 15 X 42.5 cm.